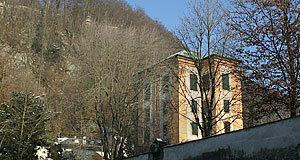 The castle of Schloss Elsenheim was built by the later mayor of Salzburg, Hans Elsenheimer, in 1449. It was partially altered and re-decorated in the 17th century. The current façade of Elsenheim Castle was added in the late 18th century, when the building was modernised. The tower-like building was extended and got one little decorative tower on the South-side of the main castle and one on the North-side. In the fourth floor, the painter Franz von Pausinger had his atelier. After him, Franz Jung-Ilsenenheim was the second artist calling Elsenheim Castle his home. He was a well-known illustrator specialising on historic and natural subjects. You can still see some of his dioramas in the "Haus der Natur" natural history museum. There is a high wall around Schloss Elsenheim, which makes it difficult to see from the street. Around the corner you can find two more castles, Schloss Arenberg and Schloss Blumenstein. Schloss Elsenheim is private property of the Piech family (the Porsche-car heirs) and is not open to the public.